If is committed to promoting a society in which everyone is able to live safely and securely. Along with the police, rescue services, judiciary and other public authorities, the property and casualty insurance companies play a key role in creating a safe and secure society. In 2014 alone, If dealt with more than 1.8 million insurance claims. These vary greatly, ranging from private clients injured in road accidents to companies whose production has been suspended, for example, due to fire. In total, If has paid out over EUR 3 billion in claims over the past year. If endeavors to take its social responsibility beyond its business operations. Its principal objective is to constantly act in a manner that satisfies or exceeds the ethical, legal and commercial requirements placed upon the business. If P&C is a significant tax payer in the Nordic countries as the company paid corporate taxes for slightly more than EUR 200 million for the year 2013. Environmental issues are of critical importance to everyone and often have an immediate impact on the operations of the P&C insurance companies. Climate-related meteorological phenomena, such as heavy rainfalls and flooding, are becoming increasingly common. Populated areas along the coastlines of exposed regions are experiencing frequent flooding. 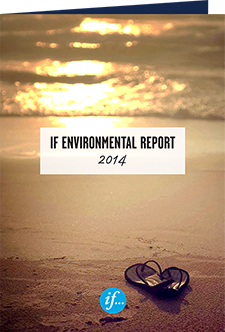 All of If's activities are governed by a strict environmental policy. The essence of this policy is that If will always endeavor to find the most environmentally viable solution for If, its clients, suppliers and partners. Environmental impact of claims handling: In 2014, If handled around 950,000 claims for damaged cars and properties. The correct handling of damaged materials is a key environmental issue. If’s goal is to reuse undamaged parts and increase recycling. As a step towards achieving this, If has implemented stringent environmental standards for its suppliers. Online filing of claims is becoming more common and represents a more environmentally responsible choice than traditional filing methods. The number of claims filed online increased by 5 per cent in 2014 and more than 35 per cent of claims are filed online today. Share of E-invoices in vehicle claims have continued to increase also in 2014. This reduces environmental impact due to decreased paper usage, printing and logistics. Climate impact: If’s carbon dioxide emissions have continued to decrease in 2014. In 2013, If launched a carbon offsetting scheme whereby it compensates for its emissions of carbon dioxide in the Nordic region by distributing energy-efficient wood-burning stoves to villages in India. The scheme is a so-called "Gold Standard project", which is an internationally recognized certification standard developed in collaboration with the World Wide Fund for Nature and other organizations. Not only do the wood-burning stoves reduce carbon dioxide emissions, they also save lives. A report published by the World Bank shows that about four million people die each year from the pollutants emitted by inefficient wood-burning stoves. If will continue with the similar offsetting program in 2015 as well. Travel and meetings: If has reduced the number of business flights taken by its employees by one third since 2007. Many of its meetings are now conducted online or as video conferences instead of face-to-face. Business area Commercial in Norway has launched three new environment related insurance products. Motor Norway tested an initiative whereby customers who were claiming on their car insurance had the option of receiving a bicycle which they could keep instead of renting a car while theirs was being repaired. This was a success and 650 bikes were delivered in 7 weeks. If published an annual review called “The Heat is On”, which is based on IPCC’s the 5th assessment report. A collaborative project on climate change adaptation and insurance has developed a web based visualization tool for home owners, called VisAdapt. If has changed to more environmentally-friendly multifunctional office machines and decreased the number of machines by 20%. If must take substantial measures to improve the environment on a daily basis. We give our staff the opportunity to act in an environmentally-friendly way through the provision of guidelines and support. We always provide information about environmental risks and participate actively in the public debate concerning climate change. A steering group, led by a member of If’s executive board, sets up and upholds If’s environmental strategy, policies and overall goals. Local Environmental Groups formulate local action plans and arrange activities for increasing awareness of environmental issues. These groups exist at all larger offices. Environmental rules for claims handling.